These simple decorating ideas make a big impact. Christmas is a magical time of year, but sometimes last-minute drinks, over-indulgent meals and frantic gift buying can make the season slightly stressful. Why not take a step back and really enjoy the season for what it should be – a time to get creative and hang out with friends and family? Here are some great DIY tips to turn your house into a fun, festive home this Christmas. Take your inspiration from those stylish Scandinavians and put a festive focus on natural textures, such as bleached wood. This bright star was created by tying together five branches of equal length and then wrapping white fairy lights around the shape. Simple and so pretty. Adding a hint of festive cheer to your kitchen can be as simple as introducing some sprigs of evergreen to your shelves. Go a merry step further by twirling a lush fern into a wreath, then tie and hang with a wide black and white ribbon for a gorgeous graphic look. Bell jars are my favourite home accessory, for the simple reason that they can be popped over practically anything and instantly make it look fabulous. This festive season, experiment by placing your shiniest gold baubles underneath a bell jar for a striking mantel display. Minimal effort for maximum impact! This tree print has huge impact and is incredibly easy to make. Find yourself some black paper and cut multiple fir tree motifs from it, then simply stick to a blank white canvas or large white cardboard sheet for a magical monochrome look with a festive flavour. Try popping a bunched up string of fairy lights underneath a glass bell jar or in a large glass bowl, along with some shiny baubles to catch and refract the light, for a twinkling Christmas display that will shine bright into the night. When is a tree a Christmas tree? When it’s covered in Christmas decorations, of course! Make do with whatever type of tree or shrub you can get your hands on and decorate to your heart’s content. 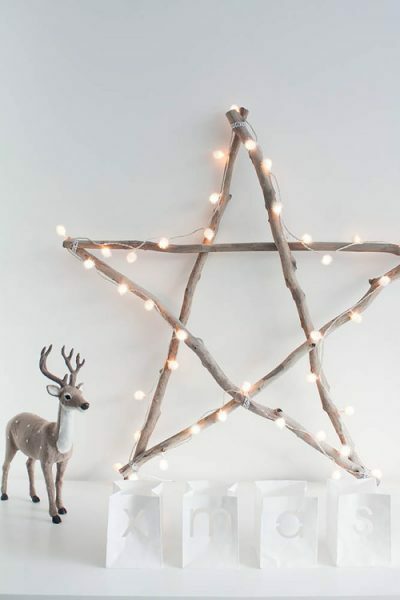 A star garland draped across your mantel can be simple but stunning. Cut a simple, five-point star template from some cardboard and use this to cut a further 20 to 30 stars from plain white paper. Sew the stars together using a length of white thread and – hey presto – you’ve just made a beautiful festive garland. Go your own way this season and instead of decorating an actual tree, draw one! Yes, this requires a bit of blackboard paint preparatory work, but it’s so worth it. Use chalk to create a simple tree outline and then decorate however you wish – use a home-made star garland to drape the boughs or use actual ornaments, tacking them onto the wall for a 3D feel. For such a beautifully festive aesthetic, this look is unbelievably easy to recreate. On your next jaunt to the park, grab some long tree branches and leave them to dry. Then arrange them in a heavy vase and decorate with simple, white decorations. Do keep them light, though – heavy ornaments could result in unintentional accidents. Grab your favourite fauna decoration and pop it under a glass dome for a fun, festive look. Arrange with similarly sized candle holders and other joyful accessories for a playful look this season. Celebrate Christmas your way with a unique wall mural. This one has been created by mounting straw hats in a tree shape, topped off with a bold red star. But why stop there? Experiment with other Christmassy accessories, such as baubles or wreaths, for a festive look that really reflects you.